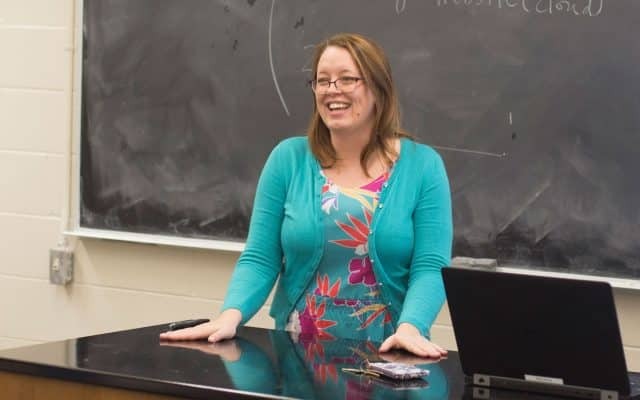 "The most fulfilling part of teaching at Hillsdale College is watching as students find their own passion and contribute their own verse." “Navigating Membrane Protein Structure, Dynamics, and Energy Landscapes Using Spin Labeling and EPR Spectroscopy” in Methods in Enzymology 564 (2015): 349-387. “Toward the fourth dimension of membrane protein structure: insight into dynamics from spin-labeling EPR spectroscopy” in Structure 19, no. 11 (2011): 1549-1561. “Algorithm for selection of optimized EPR distance restraints for de novo protein structure determination” in Journal of Structural Biology 173, no. 3 (2011): 549-557. Life is fascinating, isn’t it? The world is so full of life that sometimes we might take it for granted. But life is special. Life is chemically complex, a highly ordered anomaly in a universe filled to the brim with disorder. You are far more complex than a rock, a star or even a galaxy. Just think: every breath you take, every move you make, is the result of the coordinated interactions of an astronomical number of molecules on a truly massive scale. What forces drive this order, promote these interactions, and coordinate these processes? That’s the best part. It’s not magic, it’s chemistry and physics! The most exciting part of the study of biochemistry is how much we actually can know. Our technology has progressed to the point that we have the ability to understand, in large part, how our own machinery works, in our own time. What a time to be alive! For me, teaching at Hillsdale College means that I get to engage with my passion everyday. Furthermore, I am allowed the privilege of aiding students in their own journeys of discovery, which is both thrilling and humbling. The most fulfilling part of teaching at Hillsdale College is watching as students find their own passion and contribute their own verse.